Abstract raindrop textured faux leather and a rich burning ember color make the Miche Bag Reese Classic Shell for a real stand-out. Casual chic soars to a whole new level thanks to a pair of smart buckled belt accents in dark chocolate pebbled faux leather. 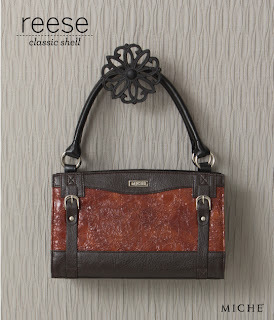 Reese is ideal for the woman who enjoys rich colors and the very latest in styling.